Vital Choice’s Seafood arrives at your door on dry ice, imbued with the fresh-caught flavor, texture, and nutritional benefits that premium quality fish and shellfish should provide. Professional chefs agree with Jane Brody, longtime food/nutrition columnist for The New York Times, who once wrote, “The freshest seafood is that which has been frozen shortly after harvest and remains that way until cooked”. Our prices won’t be as low as some retailers selling wild salmon … and that’s what shoppers who seek high quality and real value will expect. We earn about the same profit as most retail markets, but you enjoy seafood of much higher initial and delivered quality, at a perfectly fair price. Savvy Vital Choice customers order larger quantities, which provide very substantial savings …. And, orders of $99.00 or more include Free Shipping. Eat it Raw…Garlic that is! The pungent smell is pretty unmistakable. Whether it’s cooked up with some r oasted veggies, thrown into pasta sauce for some added punch, or smeared onto fresh French bread, garlic can add amazing character to whatever dish you create. And, as it turns out, eating it doesn’t just taste amazing, but it also offers a lot of health benefits as well, some of which are intensified when garlic is consumed raw. Garlic has been used for thousands of years, and not just to spice up dinner. It has strong medicinal properties that have origins in ancient Egypt. Later on, in the 18th century, French gravediggers drank wine infused with crushed garlic in an effort to ward off the plague. And, during both World Wars, garlic was a preventative measure given to soldiers to fight against gangrene—medics found that applying the plant to wounds would clean the area and stop infection. Today, garlic makes regular appearances in flavorful dishes and is also known for many heart health capabilities. Consuming garlic can prevent hardening of the arteries (which is a leading cause of heart attack and stroke), high cholesterol, high blood pressure, and can also offer a boost to the immune system in times of need. Additional research indicates that regular consumption of garlic might also help protect against cancer, which may be due to the fact that the plant has plenty of antioxidants that are known to stop free radicals from building up and contributing to chronic diseases that also includes Alzheimer’s disease. Garlic has two molecules, alliin and alliinase, which are stored in different cells in fresh garlic. The distinct flavor behind this plant happens when alliin reacts with alliinase, a process that is highly accelerated when cloves are crushed, cut up, or even damaged. After about ten seconds of this physical activity, the two compounds merge to create the phytochemical allicin, a potent antimicrobial and antifungal agent. Since it’s relatively unstable, though, allicin degrades within a day. Heat will also destroy allicin, so while you might think you’re getting all of the amazing health perks from your garlic when sauteing in a pan, you’re likely losing a lot of them due to the high temperature. In fact, the most beneficial use of garlic is consuming it raw, and within a few minutes of crushing the cloves. Even when cooked, garlic can still have some benefit on the human body, but when raw it’s quite powerful. It also doesn’t need to be eaten to provide a positive effect; garlic is great in a variety of topical uses as well. Here are just some of the surprising benefits it imparts. The antifungal properties of garlic are attributed to allicin. It’s so potent in fact that garlic has been used to treat acne and the overgrowth of Candida yeast in various parts of the body, which can lead to sore throats and yeast infections. Some herbalists also believe that garlic might have the ability to heal dandruff since it has been seen as proactive in fighting Pityrosporum ovale, a fungus that lives on the scalp and plays a role in the development of itchy, flaky skin. Allicin has also been deemed as one of the most potent sources of antioxidants in food. As the body breathes in oxygen, anything that interacts with the molecule can become oxidized and turn into free radicals that wind up damaging cells. However, eating a lot of plant-based foods with natural antioxidants can prevent this phenomenon from happening. Antioxidants are known for fighting free radicals, and in turn, can help to prevent a number of chronic diseases such as diabetes, cardiovascular disease, eye disorders, Alzheimer’s disease, even certain types of cancer. Additionally, garlic has a number of antioxidant vitamins and minerals inside, such as collagen-boosting vitamin C, immune-supporting zinc, and thyroid-regulating selenium. Ever since garlic was used in World War I and II to disinfect and heal wounds, several studies have confirmed its potent antibacterial and antiviral effects. 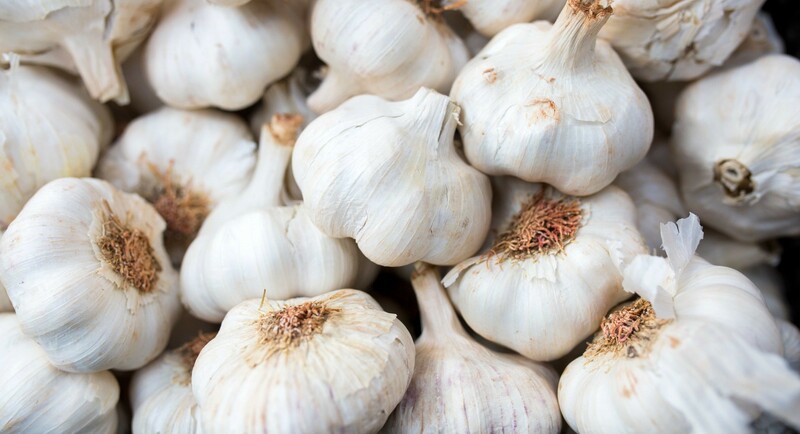 It’s so powerful, in fact, that garlic supplements have been used successfully against strep throat, staph infections, and even anthrax bacteria. Although more research is currently underway, garlic seems to be especially effective in treating difficult infections where the body may have become resistant to certain drugs and antibiotics. Because of these rich antibacterial properties, garlic has been seen has having the ability to block the formation and stop the activation of cancer-causing substances. Research has also shown that raw garlic can enhance DNA repair and induce the death of cells that are deemed as unneeded or abnormal. This facet alone speaks greatly of the power of this incredible plant. Obviously, since you’ll want to take advantage of the benefits of raw garlic, you should always purchase bulbs fresh. Though garlic flakes, powders, and pastes are convenient and just as tasty, they don’t often impart the same health effect. The main thing to look for is garlic that is undamaged. You’ll want to find bulbs that are plump and don’t have any broken outer skin. When holding the garlic, it should feel weighty; and when gently squeezing the bulb between your fingers, it should appear firm—not mushy or damp. Soft and shriveled garlic bulbs will not provide the same potent power as a fresh bulb, so you should heed any that have mold or have started to sprout (indicating the plant is older and near the end of its lifespan). If you want to try garlic for medicinal purposes (especially topical concerns), first consult with a doctor. The plant is also a tasty ingredient beyond its health benefits. There’s no real limit to how much you can consume (though you might want to have some mints or gum on hand for afterward); but if you want to soften the smell and taste you can add some fennel seeds to counteract it and use these helpful tricks to rid the scent from your hands and clothing. When you’re ready to cook, here are some of Thrive Market’s favorite ways to incorporate garlic into a number of dishes. 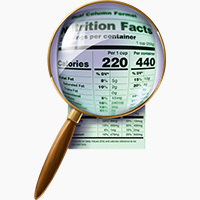 The Nutrition Facts label just got a makeover, and there’s good news and bad news. The good news: the new label makes it easier to spot (and avoid) calories from added sugar. Predictably, the sugar industry is angry, which should make the rest of us very happy (Scientific American). And another bonus: the FDA is cracking down on misleading names for sugar. “Evaporated cane juice” won’t be allowed any longer. Food manufacturers will have to call it by its real name: sugar. Serving sizes have also been updated to reflect the amount that people actually eat, so we’ll get a lot less nonsense like foods that are technically “fat free” because the serving size is impossibly tiny. The bad news: calories are being even more strongly emphasized as The One True Number that makes a food “healthy” or “unhealthy.” The calorie count is now in enormous font right at the top of the label. We’ve already discussed how the focus on “calorie balance” is really all about the junk-food lobby (it lets Coke justify advertising all kinds of junk because if all you care about is calories, then calories from Coke and calories from broccoli are the same). And calorie-counting doesn’t help people lose weight in the real world – really, it doesn’t! There are also some changes to the required vitamins: vitamins A and C will no longer be required (but manufacturers can choose to keep listing them if they want). And vitamin D and potassium will now be required. Probably a good change, although not hugely significant. You never prepared “Saw-Such” a great meal! Traditional Italian cooking is all about simplicity, and bringing out the best of fresh ingredients. 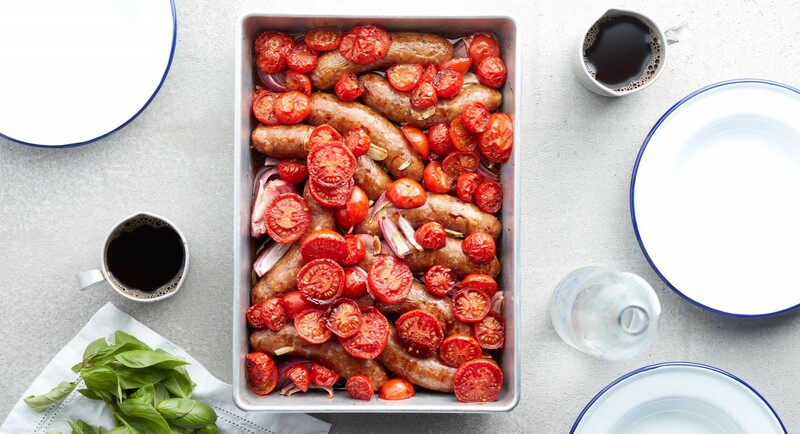 This satisfying one-pan dinner—with a sweet and savory medley of onions, garlic, cherry tomatoes, balsamic vinegar, and Italian sausage—is bursting with flavor. Preheat oven to 350 degrees.Toss together sausages, red onions, and garlic with olive oil in a roasting pan. Roast in oven 15 minutes, then mix in tomatoes, balsamic vinegar, and salt. Return to oven and roast 15 minutes more. Serve with basil leaves. Tom Brady has no NUTS! After people obsessed over Tom Brady’s balls it’s only natural his nuts were next.If you’re looking for a healthy snack to help you deflate a few pounds, the Patriots quarterback is selling a $50 box of snacks through his TB12 store. The new product launched on Monday and was already sold out by Wednesday morning. The box of snacks come with 12 bags featuring six different varieties of raw, vegan, organic, gluten-free and dairy-free nuts and fruits. The snacks included Blueberry Crunch, Amazon Crunch, Superfood Energy Squares, Cacao Goji Energy Squares and Dark Cocoa Coconut. The website didn’t say when more would be available or how many were sold. Brady will have the first quarter of the NFL season to focus on selling his products. The Patriots quarterback is suspended for his involvement in Deflategate. Other products sold on the TB12 site include a $200 cookbook, $50 protein and electrolytes for $15.